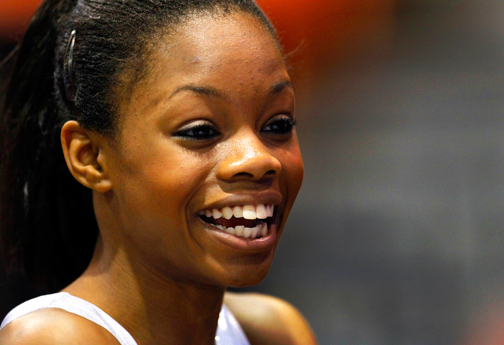 From the moment she was a pint size three year-old toddler and her sister Arielle taught her how to do a cartwheel, Gabrielle ‘Gabby’ Douglas wanted more. So on her own she began doing cartwheels on one hand. Douglas participates in a sport that is not just void of African Americans; it rarely attracts them because from an economic standpoint in many instances it’s not feasible. Gymnastics is one of those elite individual sports that require a lot of time and a whole lot of money, but if you are really good as Douglas has proven to be you can push your way onto the Olympic stage. Douglas, born in Virginia Beach, VA, didn’t just qualify for the London Olympics, but she has taken the Olympics and sport by storm leading the American women team to a team gold medal on Tuesday and qualifying in the all around category. It was only the second time in Olympic history that American women had captured team gold. Douglas is the first African American to share such honors. Atlanta Games, and thanks in large part to the girl they call ‘Flying Squirrel’ the 2012 team is in the history books again. After reigning world champion Jordyn Weiber of was knocked out of the finals for the all-around title two days earlier by Douglas, Gabby then turned her attention to the team finals and as usual was dynamic and courageous posting an eye popping 15.966. Again she bested Wieber who had set the tone by earning 15.933 points. Douglas qualified at the U.S. Olympic trials on June 28 through July 1 and thus joined the ranks of other African-American Olympic gymnasts, including Dominique Dawes and Betty Okino, who won, along with their U.S. teammates, the Olympic Team Bronze medal in 1992, and Tasha Schwikert, who joined Dawes on the U.S. team in 2000. Now, Douglas aims to win an individual medal in the sport, which would make her the first black woman to do so since Dawes' bronze-medal win in 1996. She will have her opportunity when she competes for the all around title, a competition she nearly won at the USA gymnastics national championships in St. Louis. On the greatest stage of all she is inspired to regain her winning ways at the London Olympics. The road to the Olympics has been a challenging one. This daughter of Timothy Douglas and Natalie Hawkins had to move from her family in 2012 to West Des Moines, Iowa so that she could receive the essential training to be an elite gymnast. It was in Iowa where she trained with 2008 Olympic coach Liang Chow to hone her gifted skills. She lives with a host family, but the separation from home and family has been a difficult adjustment for her. Douglas had demonstrated early on that she would be special, winning the 2004 State Championship title in Virginia. Gabby, as she is affectionately called, burst onto the nation scene in 2012 at the Nastia Liukin SuperGirl Cup in Massachusetts where she finished fourth in the all around. From there it was onto Chicago where she placed third on the balance beam, 6th on the vault and 9th in the all around junior division. She then went on to the 2010 U.S. Junior National Championships and captured a silver medal on balance beam, placed fourth all-around and on vault, and tied for eighth on floor exercise. 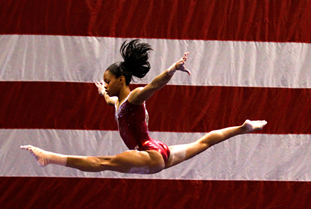 Douglas competed at in the 2010 Pan American Championships in Guadalajara, Mexico where she won the uneven bars crown, and she also won a share of the U.S. team gold medal. She has competed at the world famous Madison Square Garden and soon will be a household name after her monumental achievements at the London Olympics. 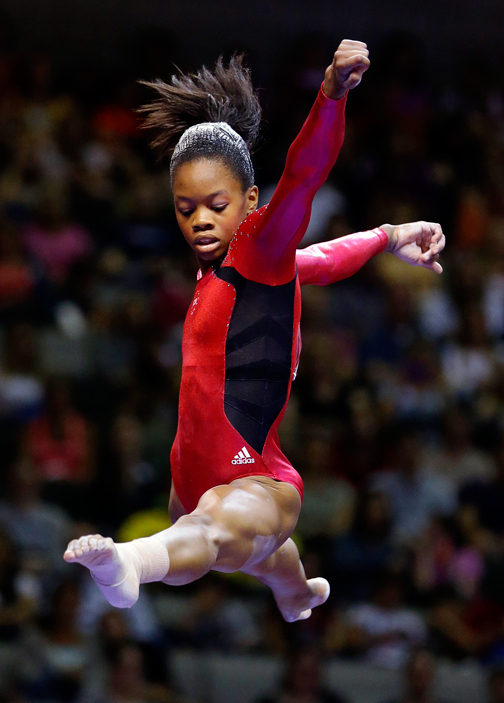 Gabby’s accomplishments at the London Olympics might be greater than any African American Olympian, including the highly decorated USA men basketball team. That glowing smile, those elegant and graceful moves in a sport that is placed on a shelf for too many to reach. She didn’t just get there, but is soon to be standing alone with an Olympic medal draped around her neck for the world to see.